List of states in Germany – Germany is one of European country, located in central-western Europe. It is a federal parliamentary republic and officially known as Federal Republic of Germany. How many states in Germany? Currently there are 16 federal states of Germany. 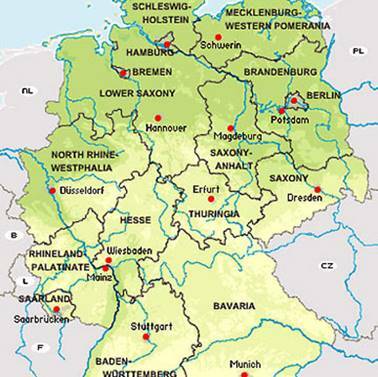 Each German federal states have their own area and capital. In this article, we will discuss names of states in Germany and their capital, area and population size. As a federal country, Germany consist several states. How many states does Germany have? Currently the number of states in Germany are 16. It includes 3 city-states (Berlin, Hamburg, Bremen) and 13 area states. Federal Republic of Germany created in 1949 in the aftermath of World War II. Initially there are only 11 list of states in Germany. German reunification in 1992, in which East Germany (German Democratic Republic) ascended into West Germany, affects the number of states in Germany. After that, Germany have 16 states all over the country with Berlin as its capital city. The largest states in Germany by area is Bavaria (70,549 km square) while the smallest states in Germany by area is Bremen (419 km square). The most populous states in Germany is North Rhine-Westphalia (17,865,516) while the least populous states in Germany is Bremen (671,489). Below we will provide list of Germany states that covers all 16 states of Germany and their capital, total area and population. Here are full list of states and capitals in Germany alphabetically. Those are full list of all German states and capitals along with its names, year joined Germany, total area, latest population size and legislatures. Currently, Germany is a federal republic consisting 16 list of states in Germany above, including 3 German city states (or Stadtstaaten) such as Berlin (as capital city of Germany), Hamburg and Bremen.